Are you a troublemaker? 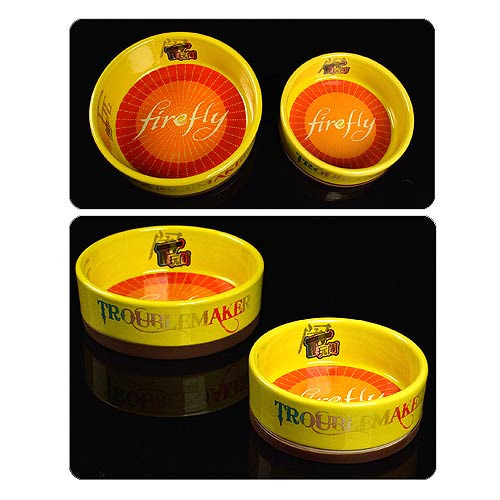 Based on a T-shirt made famous by mercenary Jayne Cobb in the sci-fi Western TV series Firefly, the Firefly Troublemaker Ceramic Bowl Set is perfect for any troublemaker in your home. Made of sturdy stoneware, it includes a removable silicone ring to protect surfaces and prevent sliding. Dishwasher, microwave and oven safe (up to 480 degrees F (250 degrees C). Includes 1x 10 ounce bowl and 1x 18 ounce bowl.